Key Asian stock markets closed down sharply Monday, and Europe markets followed the course at the open, continuing a global slide that saw U.S. markets drop 3 percent Friday. China's Shanghai exchange ended the day down nearly 8.5 percent as investors watched to see what action Beijing might take. The fall in markets across the globe in recent days is keyed mainly by a fear about a Chinese economy that is slowing more than had been expected. 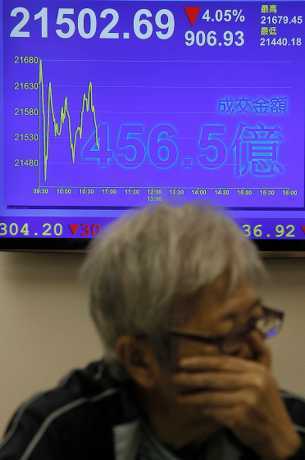 Japan's Nikkei lost 4.6 percent Monday for its lowest close in nearly a year. 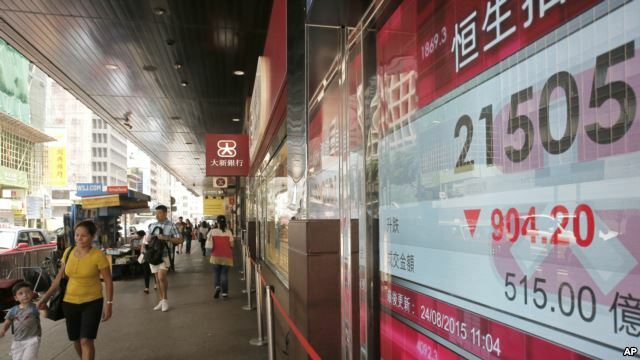 Hong Kong's Hang Seng fell 4.9 percent. Other markets in the Pacific region were also down sharply. Meanwhile, markets in Britain, France and Germany all opened at least 2.5 percent lower. Hong Kong stocks fell by 4.64 percent by the break, hitting a fresh 15-month low as a rout across Asian shares continued a sell-off in Asian equities. The benchmark Hang Seng Index lost 1,039.92 points to 21,369.7 by the end of morning trading on turnover of HK$70.87 billion. Chinese shares also plummeted, wiping out the year's gains and leading a slump across Asian equities. The benchmark Shanghai Composite Index plunged by 8.45 percent, or 296.54 points, to 3,211.20 by the break – below its closing level on December 31 last year, wiping out all its 2015 gains – after losing as much as 8.59 percent. The Shenzhen Composite Index, which tracks stocks on China's second exchange, fell by 7.61 percent, or 155.24 points, to 1,884.16. Taipei recorded its biggest-ever intraday drop, at 7.46 percent, while regional markets also slumped, including Tokyo's Nikkei 225, which fell by 3.21 percent. Oil was trading below the US$40 a barrel mark, at its lowest level since 2009. Today's fall took the Shanghai index well below the 3,500 mark, which had been seen as a symbolic moat authorities would seek to protect. Some analysts predicted more government intervention by the so-called “national team,’’ a description for entities, including the CSF, that are trading on behalf of the government. The Philippine stock market fell by 6.40 percent by midday, pulled down by developments in China and the United States, dealers said. The benchmark index fell 466.15 points in morning trading, virtually wiping out all the gains made in 2015, when it was hitting record highs. “Eighty to ninety percent of this sell-off is due to what is happening in China and the US. If you examine our fundamentals, we are still intact,'' Louis Limlingan, head of sales at Regina Capital Development told AFP.